ReforgeLite is a lightweight reforging calculator that helps you figure out the optimal strategy to reforge your gear given your stat weights and caps without leaving the game. Downloads are still only available through Curse page. Please describe your problem, and, most importantly, attach a debug log that you can find by scrolling to the bottom of the main UI window (the "Debug" button inside settings section). To open the addon window, type /reforge or talk to the reforging master. On the left half of the window you can see your current item stats for reference. On the right side you can set up stat weights/caps, or select an existing preset (presets are regularly updated from http://www.noxxic.com, which in turn gets its information from Elitist Jerks). In the simplified mode, you can specify the stat priority, along with up to two capped stats (each capped stats can have an arbitrary number of breakpoints). If you want more control, you can go into advanced mode and enter the exact stats specific for your gear, obtained from a tool such as SimulationCraft. Behind the hood, simplified mode sets the lowest stat to a weight of 100, and each next stat adds 20. When you switch between the two modes, ReforgeLite converts your current weights to the other format. When you're done setting up weights/caps, press Calculate. The calculations are fairly memory/time intensive, so ReforgeLite might trade some precision for speed, though the losses should be minimal. You can press the Calculate button a few times if you want to try getting a better result, the output will always display the best result so far. Once the calculation finishes, you will see a section with your stats after reforging, and the difference from your current stats. Click on the Show button to see which items should be reforged. If the reforging UI is open, you can click on the Reforge button to automatically reforge all items in the selected way. Do not interfere in the process (clicking the cancel button or closing the reforging UI is fine). Caution: I'm only human, so while I try my best, I can not guarantee that this process is absolutely bug free, so its recommended to watch over the process. If you leave to make some tea and come back to find it spending thousands of gold reforging your boots over and over again, don't tell me I didn't warn you. FAQ: The results seem incorrect. I'm getting too much/too little hit/expertise/etc. 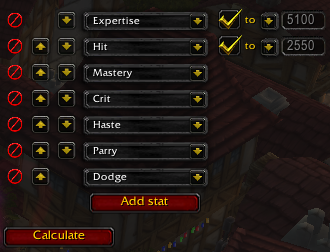 First of all, with Mists of Pandaria, expertise now affects spell hit, so it is not uncommon for casters to reforge into some expertise (on items that already have hit) to reach the cap, especially at lower gear levels. Note that ReforgeLite directly adds your expertise rating to hit rating, which is not the way it is displayed in the game, but it is more convenient when verifying the result. Also, keep in mind that ReforgeLite uses your currently active spec to decide which stat conversions are in place, so if you're a Paladin trying to reforge your Protection gear while in Holy spec, you will likely get very little hit because it thinks you get enough from expertise. If you are still not satisfied with the results, feel free to e-mail me (at d07.riv@gmail.com) with a brief description of the problem and a debug log (found at the bottom of the scrollable arera, in the options category). FAQ: I'm using certain items for my off-spec and I don't want their reforge changed. Simply click on an item icon in the large stats table, this will lock the item's reforge. This is a very popular demand, and I'm sorry to tell you that it is not possible with the algorithm I'm currently using. I'm fairly sure the only other way to go is a brute force approach, which is simply way too slow to work in a Lua environment. There are plenty of external tools that employ it, such as http://www.wowreforge.com. I will be adding an import option in the near future to make it easier to use their results. You might notice that you can't enter anything besides digits in the weight boxes. This was done for simplicity's sake, and it does not limit you at all - you can multiply all your weights by a 100 (or whatever you prefer) to make them integers, and that would not affect the result at all. FAQ: My reforge/results window isn't showing up. What do? First, ensure that the addon is enabled (and not marked as outdated if you haven't checked the box to load out-of-date addons). If the addon isn't loaded, you should get an error when trying to type /reforge in chat. Second, try enabling Lua errors in the game options. If this causes error messages to show up when you try to open the reforge window, then send me the text of the error and I'll figure something out. Third, it is possible that you accidentally moved the window off-screen. The easiest way to fix this is by deleting the addon config file located at <game folder>/WTF/Account/<your account>/SavedVariables/ReforgeLite.lua - this should reset the addon settings to default (make sure you're in game when doing that, or the file will simply reappear). This will also delete your custom weight and reforge presets - if you want to avoid that, you can try editing the said file, by changing the values of variables "windowX", "windowY", "methodWindowX" and "methodWindowY". Values such as 100 for X and 500 for Y should make the window(s) visible at least. If you're talking about reforging for Mistweaver haste breakpoints, you need to make sure that you're in tiger stance when you calculate or you'll get the wrong results. What cawesley wrote.. I love this addon, and it makes everything much easier - but ever since switching to a monk where you have a certain haste cap you want to achieve, this addon just doesnt suffice. I love this addon. I don't know how much easier it has made reforging for me. I was wondering though, is it possible to have 3 cap stats? On my windwalker monk, I need hit and expertise caps, but would also like to add a haste cap so then everything over that can get thrown into haste. I'm not sure, but I think other classes might be like this too. Any input you could give would be greatly appreciated. For me it doesn't work at all. When using the calculate button nothing happens. All the calculated is showing zero. Also, it is marked as outdated. Hi, it's not working for asia 25 raid items, i.e. 530 iLv ones. Can you pls fix for that. Is there anything not working correctly aside from it being marked as outdated? I know it doesn't work with 25-raid items yet, I have an update ready, and will release it once I fix a couple other things. Regarding the speed slider, I'll probably add it back, but I think you'd get better results by keeping the speed roughly as it is now and clicking the button multiple times, instead of using a slower speed and clicking it once. All 5.1 patching aside every since you removed the slider bar reforgelite hasn't been quite as accurate, i've found myself reforging and then calculating, then reforging again for better itemization. This usually happens 2-3 times for every couple of new pieces of gear i'm throwing into the mix. "Last update Oct 14, 2012" -> New Update for 5.1 please. Is it possible to add third caps? I tried to add a haste cap besides exp's and hit's on normal mode, but it doesn't work. In advanced mode you actually can't add third capped-stats. Please send me a debug log (at the bottom of settings) so I can have a look at what's causing it. Get overcap hit rating when try to reforge my warlock to at least 5100 hit and at least 4750 haste. Addon make 5100 hit raitng (as he wrote in table) and reforge some stats to expertise. So i get about 17% hit in charecter tooltip. How to resolve this? p.s. : Make this after many pushes button calculate. He make it whith out expertise. It`s my first great problem with greatest addon. Oh I see, if its nil then it gets replaced by default values next time the addon is loaded. Fixing that. I assume you meant the lines around 1000 in ReforgeLite.lua? I can't see the difference, as ReforgeLiteDB should be the same as self.db, and pretty sure it won't care if unchecked is nil or false, no? Pushed a change that fixes settings not being saved. It seems that hit and expertise are the same to the spell casters... so if all equipments are reforged to hit ratings and i still don't get the hit cap.. those euipments which have hit ratings originally should be reforged to expertise... but ReforgeLite doesn't do this! Well, then it must be some other issue, because I triple-checked and didn't find any non-localized underscores. I know there's also a blizzard bug with UIDropDownTemplate tainting compact unit frames if an addon creates a menu during load, but that's not exactly blizzard related.